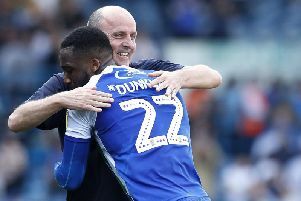 Paul Cook has been handed a very timely fitness boost with Gavin Massey successfully coming through his long-awaited return from major hamstring surgery. And the forward, who’s been sidelined since pulling up lame at QPR on August 25, is in contention for a first-team return this weekend at Ipswich. Massey played the first half of the Development Squad’s 3-1 defeat at Sheffield United on Tuesday afternoon, and Cook has pencilled him in for an instant return to the first-team fold. “Gavin’s back with the first team, and there’s a plan for him to be involved at Ipswich,” Cook revealed at the end of last week. “And I have to say again there’s been no rush getting Gavin back quicker than he should be. Writing as a guest columnist in the Wigan Post last month, Massey himself admitted he could see the light at the end of a long tunnel. “We’ve got a comeback date in our heads and, if all goes well, hopefully I’ll be back by then,” he admitted. “I don’t want to say what that date is, because I don’t want to be putting any undue pressure on myself. “The last thing I want to do is come back too early and make it worse, that would be a nightmare. “But it’s crazy the amount of injuries we’ve had already this season. “And they’ve been to some pretty major players, like Crackers and Griggy. “We’re obviously all devastated to be out and doing everything we can to get back and help the team. The return of Massey will be music to the ears of Cook, who is without fellow forwards Michael Jacobs and Nick Powell until the New Year, as well as defenders Chey Dunkley and Antonee Robinson. Kal Naismith will also miss the trip to Ipswich through suspension, after being red-carded in last weekend’s 1-0 home defeat to Derby. And that will mean a major reshuffle at the back with round pegs being squeezed into square holes. Latics switched to a back five against Derby, with Callum Connolly used as an extra centre-back and Nathan Byrne dropping back to left wing-back. A continuation of that could open the door for Massey to make his return further up the park. Another option would be to bring in Alex Bruce at centre-back and switch Dan Burn to left-back, although Cook has admitted in the past his reluctance to make wholesale changes to cover one absence.